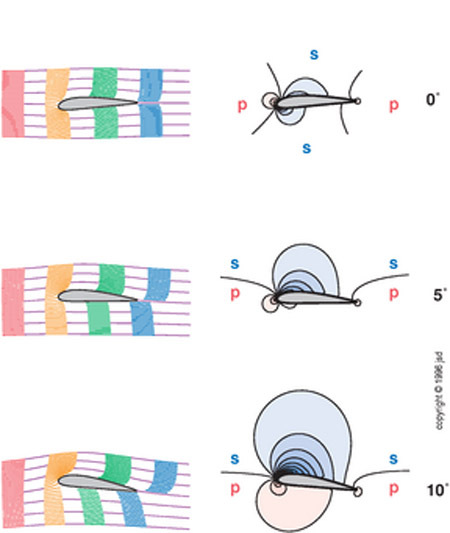 An airfoil is a body (such as an airplane wing or helicopter blade) designed to provide a desired reaction force when in motion relative to the surrounding air. There has been much discussion with regards to how and why airfoils really work. 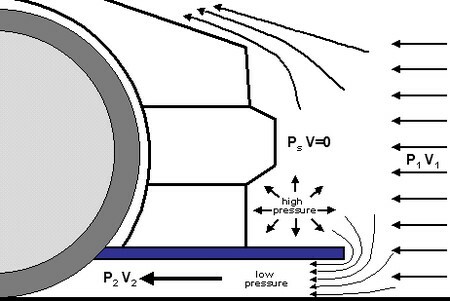 The popularly-known explanation (as seen in K-6 textbooks) involves mis-applying Bernoulli’s principle by stating that high-pressure, low-velocity air on the bottom-side of the airfoil and low-pressure, high-velocity air on the top-side, which recombines at the trailing edge of the airfoil at the same time, regardless of angle-of-attack, is the sole mechanism by which lift is generated. Besides using Bernoulli’s principles (which accounts for conservation of energy), Newton’s principles (conservation of momentum), Euler’s equations (conservation of mass, momentum, and energy), and Navier-Stokes equations (all of the above plus viscosity) must also be dealt with in order to fully understand the generation of lift. 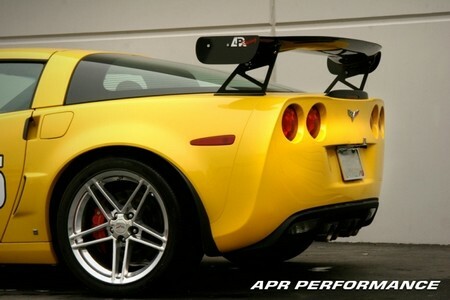 Airfoils, when properly mounted at the rear-end of a race car, can generate large amounts of downforce. 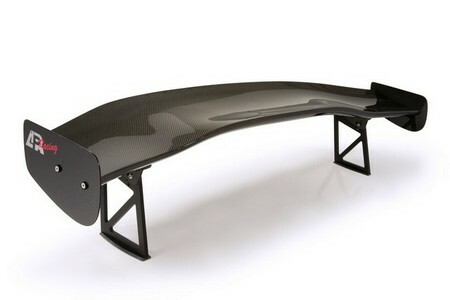 This downforce offsets the aerodynamic lift inherent to the car, and in turn increases the amount of tire grip available. This increased tire grip allows the car to carry higher speeds through the corners and out of corner exits. Being able to carry the greatest corner exit speeds is critical to producing the lowest lap times, especially when there are many corners that lead to long straightaways. 4. Position in the air stream. 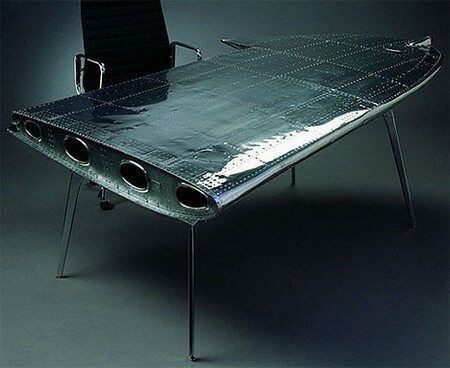 Considerations must be made for all of the above items when designing, installing, and using an airfoil on a race car. A 3D airfoil is an airfoil that has variable airfoil cross section across its span. Most modern aircraft airfoils are 3D airfoils. When a 3D airfoil is designed for use on a production-based race car, the outer sections will typically have much more AOA built-in than the center section. For example, if the center section is set to zero degrees (relative to the ground), then the outer sections may end up at 15 degrees angle (relative to the ground). There is a popular notion that, in order for an airfoil to function on a race car, the airfoil needs to be in clean, free-air at or above the rear roofline of the car. This is only a partially-true statement. On cars with solid roofs and sloping rear windows, the air that flows from the rear center edge of the roof will travel downward at an angle toward the airfoil. The problem here is that only the center section of the 2D airfoil will see this downward "push" of air, while the outer section of the 2D airfoil will see much less of this (it will see straighter, freer air). 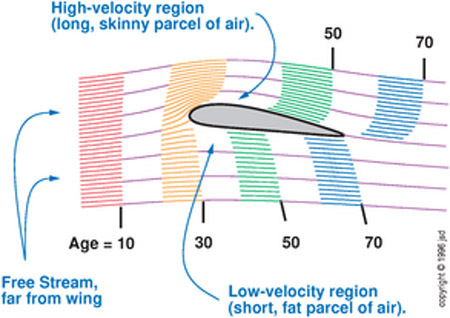 Decreasing the 2D airfoil's angle-of-attack to accommodate for the downward airflow causes the outer sections to produce relatively less downforce. Increasing the 2D airfoil's angle-of-attack causes the center section to produce relatively more downforce. The 2D airfoil ends up functioning inefficiently in this unbalanced state. This is a situation where the 3D airfoil has an advantage. 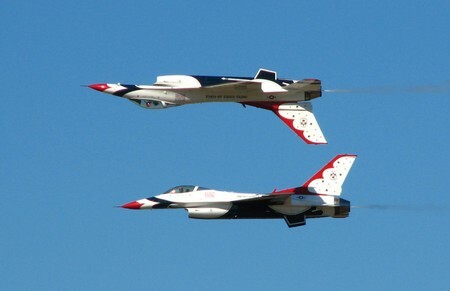 The 3D airfoil's built-in angle-of-attack variations allow it to function more efficiently when it is mounted below the roofline. When the center section is mounted at 0 degrees angle-of-attack (relative to the ground), it acts as though it has a positive (typically 15 to 20 degrees in a sedan-type car) angle-of-attack relative to the airflow coming from the rear center edge of the roof. The outer sections, with the higher angle-of-attack built-in, are better-suited to take advantage of the cleaner, freer air stream. Therefore, the 3D airfoil, when used in a sedan-type car and mounted below the roofline, is able to function more efficiently (and in a more balanced state) than a 2D airfoil. Which type of airfoil is better? There is not going to be one simple answer to this question. In reality, a better question to ask may be, "which type of airfoil is better for my application?" In some cases, it may be better to use the 2D airfoil. In other cases, it may be better to use the 3D airfoil. 1. Type of car (sedan, coupe, hatchback, open-wheel, etc.). 2. Approval of the specific airfoil (type, size, supplier, etc.) for the race series. 3. 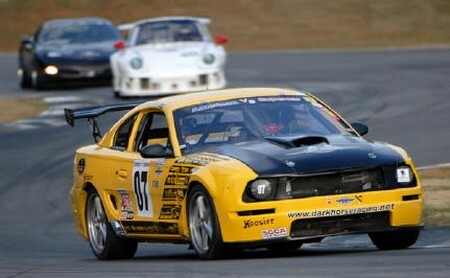 Mounting-height rules for the race series. Typically, when there is a mounting-height restriction that requires the airfoil to be mounted below the roofline, it will likely be better to use a 3D airfoil. When there is no mounting-height restriction, either a 2D airfoil mounted above the roofline or a 3D airfoil mounted below the roofline may work. A splitter (a.k.a. "front splitter") is typically found on the front-end of a race car, appearing as a flat extension to the very bottom of the front bumper. This splitter extends straight out, parallel to the ground, and can be made of carbon fiber or other stiff material. It is attached to the bottom of the front bumper, and may also be supported by two or more support rods at some distance forward of the bumper mounting points. These support rods ensure that the splitter stays parallel to the ground, even when there are outside forces around the splitter. An air dam (a.k.a. "front air dam") is usually a shaped part of the lower portion of the front bumper. 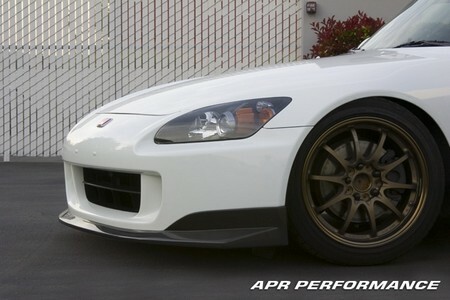 It is sometimes called a "front lip" or "lip spoiler." It can be molded as part of the front bumper, or it can be a separate part that is attached at the front-lower portion of the front bumper. Unlike the splitter, the lip is not a flat "sheet" of material. 2. To help guide air to a useful location (i.e. radiator). When a car travels at high speeds, the air pressure in front of the car can become very high. All this air ends up going both above the car (over the hood), and below the car (under the front bumper). When too much of this air gets under the front bumper, the under-car air pressure builds up. This increased air pressure contributes to lift, which causes the front-end of the car to lighten up, thereby reducing the amount of traction at the front of the car. This high pressure (and lower speed) air, when compared to the air speed above the car, will create situation where there is increased lift over the entire car. Typically, most production street cars, when traveling at higher speeds (60mph+) produce large amounts of positive lift. What we want to have is lower pressure, faster-moving air below the car, and higher pressure, slower moving air above the car. The lower pressure side, when it happends to be under the car, contributes to reduced lift. When the lift is reduced sufficiently to the point where there is negative lift, then there is net positive downforce. The splitter (or air dam) itself does not actually create downforce. What the splitter does is that it increases the area over which high pressure can build up. The more high pressure there is above the splitter, the greater the net downforce there is. Additionally, if there are openings in the front bumper (above the splitter or lip) for brake ducts or radiator cooling, this increased air pressure will encourage more air to flow into these openings. 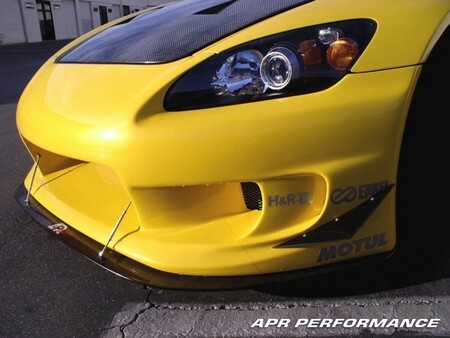 Splitters (and air dams) are effective when they are mounted close to ground level, and when they extend beyond the bottom of the front bumper. This maximizes the pressure area above the splitter, and maximizes the pressure differential between the top and bottom sides of the splitter. 1. There is sufficient airflow to the engine bay and driveline components. 2. There is sufficient ground clearance for the available suspension travel. 3. 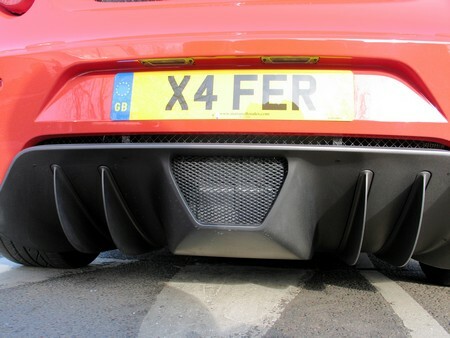 The rear diffuser (if installed), still gets the fast-moving, low pressure air it needs in order to function properly. A diffuser is a shaped part of a car's body, usually found in the underside of the car. It can be located at the rear underside, or closer to the front underside near the wheel wells. A rear diffuser is typically sloped upward from front-to-back, and may have vertical fins attached to the bottom of the sloped surface. The rest of this article will apply, for the most part, to the rear diffuser. The area immediately behind the car tends to have turbulent, slow-moving air. The fast underbody air that exits the car ends up meeting with this slow-moving outside air. The greater the air speed difference is, the more turbulence is created. This turbulence causes unwanted drag and disrupts the airflow that exits from the underbody, which in turn decreases the underbody's ability to reduce lift. The diffuser itself does not actually create downforce - it works in conjunction with other aerodynamic components to reduce drag and lift. The upward front-to-back angle of the rear diffuser causes the fast-moving underbody air to expand and slow down. This slower air is then better able to meet up with the slow outside air, thus reducing the amount of turbulence behind the car. The vertical fins are there to make sure that the air at the rear left and right sides do not disturb the function of the diffuser. As a general guideline, the rear diffuser needs to be angled upward at least 10 degrees. In order for a rear diffuser to be effective, the air that travels under the car from the front needs to be as fast and smooth as possible. Slow-moving, turbulent air is not going to help a diffuser do its job. In order to create the smooth air that the diffuser needs, it is recommended that the car have a flat undertray (a.k.a. 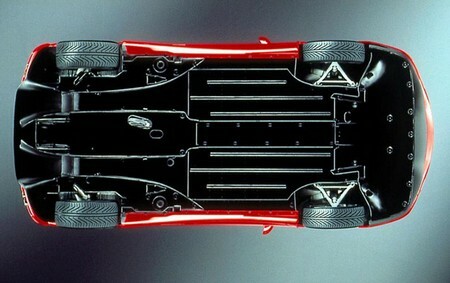 underbody) that covers most of the uneven surfaces and components on the cars bottomside. However, production road cars typically do not have, or only partially have, an area that is covered by a flat undertray. Originally created in 1958 by Dr. Roger Bacon, carbon fiber is a polymer composed mostly of carbon atoms linked in long chains. It is a lightweight and very strong material that is found in all types of products including airplanes, racecars, and golf clubs. 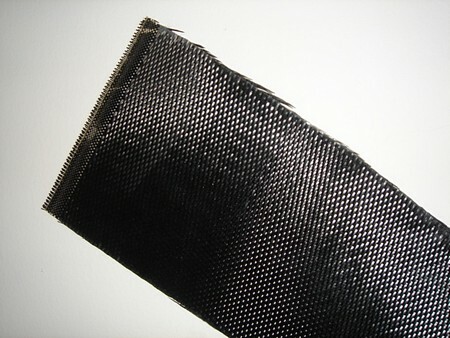 Very long strings of carbon fiber are twisted into yarns, then woven into matrix-patterned weaves. When these weaves of carbon fiber are combined with plastic resins (such as epoxy), a composite material called Carbon Fiber Reinforced Plastic (CFRP) is created. CFRP is lighter than aluminum and stronger than steel, and makes for the perfect composite for use in race cars when minimizing weight and maximizing strength are of utmost importance. Computational fluid dynamics is a specialized sub-discipline of fluid mechanics (the study of fluid physics) that involves using algebraic equations to solve fluid flow problems. CFD has origins in the aerospace industry dating back to the 1960s, where companies such as NASA, Boeing, Lockheed, and others developed their own CFD programs to perform the analysis needed for their aircraft designs. Using mathematical modeling and numerical methods, computations performed using powerful CFD software enable us to quickly predict and simulate what will occur in fluid flow situations (velocity, pressure, density, and temperature vs. time). In comparison to performing experiments in wind tunnel laboratories, CFD allows us to perform simulations in much more cost-effective, virtual laboratories. 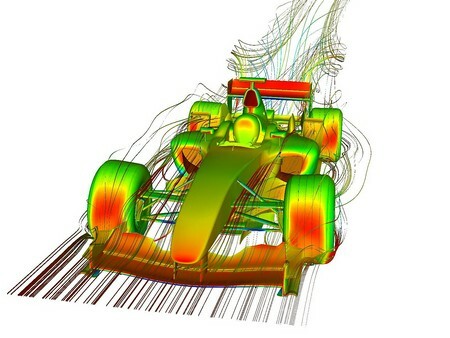 CFD is used successfully in all the top levels of motorsports, including Formula One, IndyCar, and even NASCAR. 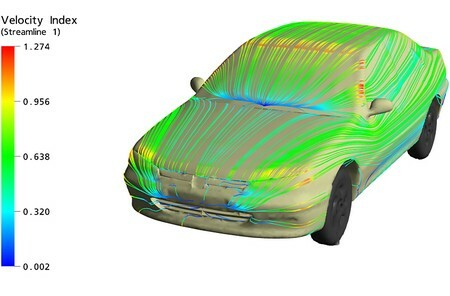 CFD is even used by car manufacturers in the development of many of today's road cars. Companies have invested tens of millions of dollars, if not more, to implement CFD design in their product. As a disclaimer, CFD is not 100% accurate. 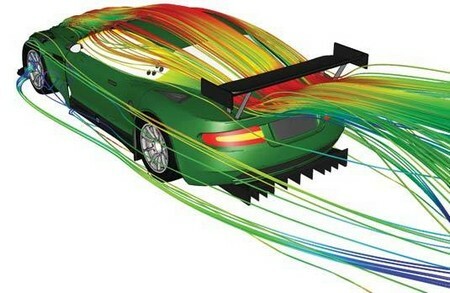 Many factors can affect the accuracy of CFD simulations, including accuracy of mathematical models, limits in computing power, and the scientist's ability to interpret the data that that comes out of the computer. 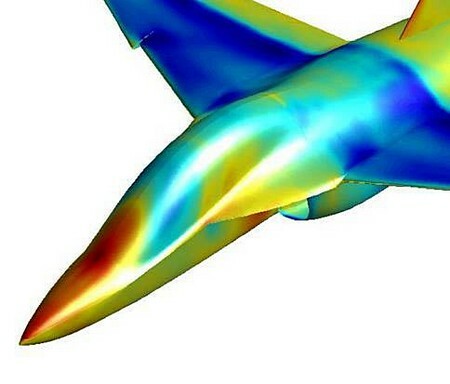 Despite its lack of total accuracy, modern-day aerodynamic design could not have progressed to its current state without the help of CFD. The results of CFD-developed automotive products are real, and can easily be seen in both race cars and road cars.